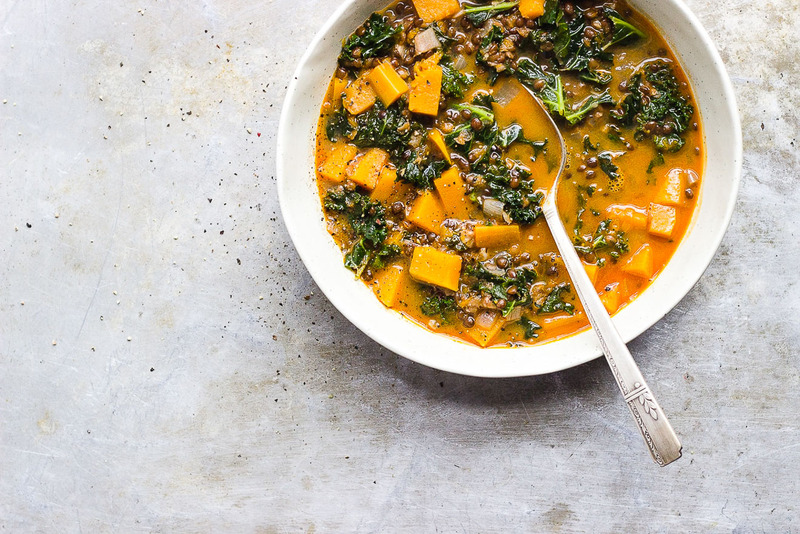 Red curry lentil stew with butternut squash, kale and creamy coconut milk. It's naturally gluten-free and vegan. 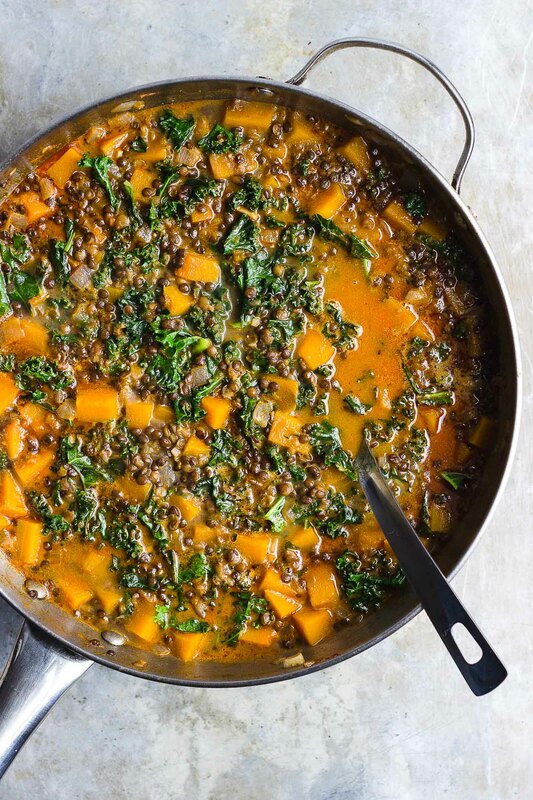 It's a hearty fall lentil stew. 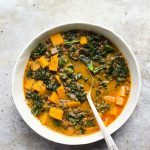 Red curry lentil stew with butternut squash and kale. For all your lovely comments on my last post. I’m slowly getting a chance to respond to them all. Actually, just in the past few days I have begun to feel a little bit more like myself. And I promise to bring this space back to its regular programming. Right after I get to the like two thousand months of abandoned emails, and my overwhelming to-do list (insert winking emoji). For now though. This red curry lentil stew is where it’s at. 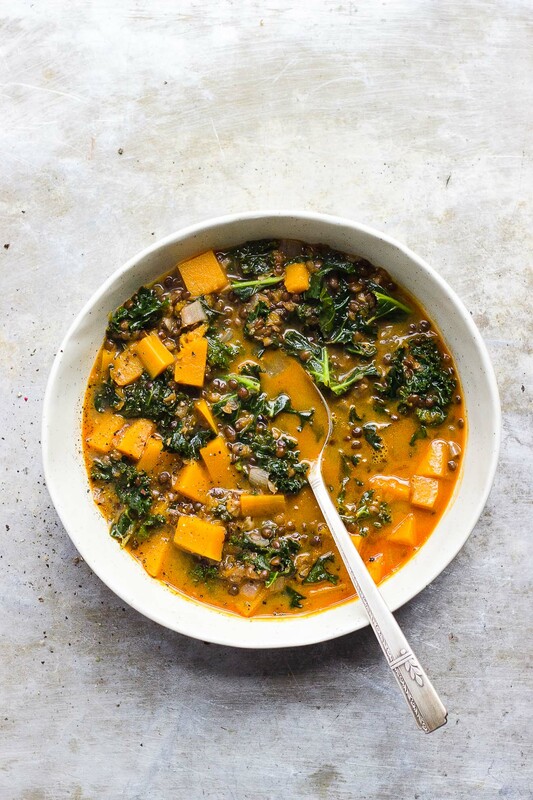 Red curry, lentils, butternut squash, kale and lots of creamy coconut milk. It kind of has it all. All of the fall ingredients, a ton of flavor wrapped into a totally hearty, savory stew. It is naturally gluten-free, and vegan (as per usual). And it is super easy to throw together in under thirty minutes. You can leftovers for quick lunches all week long. Or you can freeze the leftovers for a rainy, busy day. It full of flavor, satisfying and filling. And it’s been on repeat in my home for a while now. We can’t get enough. I hope you’ll enjoy it too. There are some really great recipes floating around the internet right now. Here are some of my favorites from some of my favorite people. Amanda from Heartbeet Kitchen’s honey garlic caramelized carrots. I cannot stop eating these. And Lily from Kale & Caramel’s citrus turmeric rever upper juice. It is bright, sunny and everything winter ever wanted you to have in a glass. Beth from Tasty Yummies’s roasted cabbage with garlic tahini and toasted pepitas is on deck for meals this week. And Renee from Will Frolic for Food’s almost raw vegan cheesecake cups with berry chia jam. Because I mean, cheesecake you guys. What are you guys into making and eating lately? I’d love to know what you’re vibing on and maybe some recipes that you might want and need too. Send me a message! I’ll just be in the kitchen making and eating this lentil stew. If you can't find or don't have black lentils, green lentils are a good substitution. In a large pot heat the olive oil on low and sauté the onion until translucent, about 5 minutes. Next add in the garlic and sauté for 1 minute more. Turn the heat up to medium and stir in the lime juice and red curry paste. Then add the lentils, broth and bay leaves. Stir, cover the pot and simmer for about 15 minutes or until the lentils are tender. Add in the butternut squash and coconut milk and stir. Simmer until the butternut squash is tender, about 7 minutes. Lastly, toss in the kale and cook for 1 minute or until it is tender and bright green. Taste and season with more salt and pepper if necessary and serve warm. Glad to hear you’re feeling better. This stew looks so lovely and warming. Perfect for a chilly and wet winter day! Sherrie, recently I am completely into the swimming of lovely squash in coconut broth – there is something so comforting that occurs in that unity. That and I will never turn down lentils Or kale – so great It’s those meals that we all have on repeat that I am constantly seeking because I know they are true gold. Giving you my feel goods feels, xo. This sounds simply divine with all of this colder weather we are having. How colorful and hearty too! This looks so good. Any chance you know the nutritional information? Nothing sounds better than stew right now. I’ve been craving warm food, with this mid-winter slump. With the red curry paste, I bet it actually warms you to the core. Such pretty light in these photos too! Glad to hear you’re feeling a little more like yourself, and thanks for mentioning my carrots, xo. I’m so glad to hear you’re starting to feel better – I hope you find something long-lasting! This soup is one of the most beautiful bowls ever! I don’t use lentils nearly enough, so thanks for the inspiration. Girl, I made this last night for one of my girlfriend’s birthday dinner and it was a huge hit. We demolished the entire pot and I sent her home with your recipe to make for her family this weekend. Thanks so much for the inspiration! I am going to go ahead and put this one on repeat. Oh, my – I love everything about this recipe! I Just did it for lunch and this is délicious. I like the taste and the smell of it. Great! I hope you’re feeling better, my dear, getting to the bottom of things. I know from experience that sometimes an illness, no matter how scary, is definitely a gentle reminder for us to slow down, take stock of our lives, and reassess how we want to allocate our precious energy. Hopefully that’s how things feel to you right now — and in the meantime, you are treating us all to some really awesome soups! Gorgeous stew – it’s perfect! Can we have a potluck and you bring this and I’ll bring the rever upper and Amanda brings carrots and Beth brings cabbage and Renee brings cheesecake?! Pretty please??? I need this in an IV to get me through the next month. You’re a dream.